One never knows where a Walker Mower may show up. In fact, a most unlikely place is the small town of Hannon, Missouri, located two hours south of Kansas City. Here, homeowner Barb King has been mowing with her Walker Mower for 16 years. Once a week on Friday, before her hair appointment, she spends nearly two hours mowing her lawn. At 78, King is the eldest of seven siblings. She was raised on a farm a stone’s throw from where she lives today, and still enjoys the outdoors and what nature has to offer. When she and her late husband purchased their property and built their home in 2000, she envisioned a yard resplendent with a variety of trees to accompany a lone elm. Barb King poses with her husband, Richard. 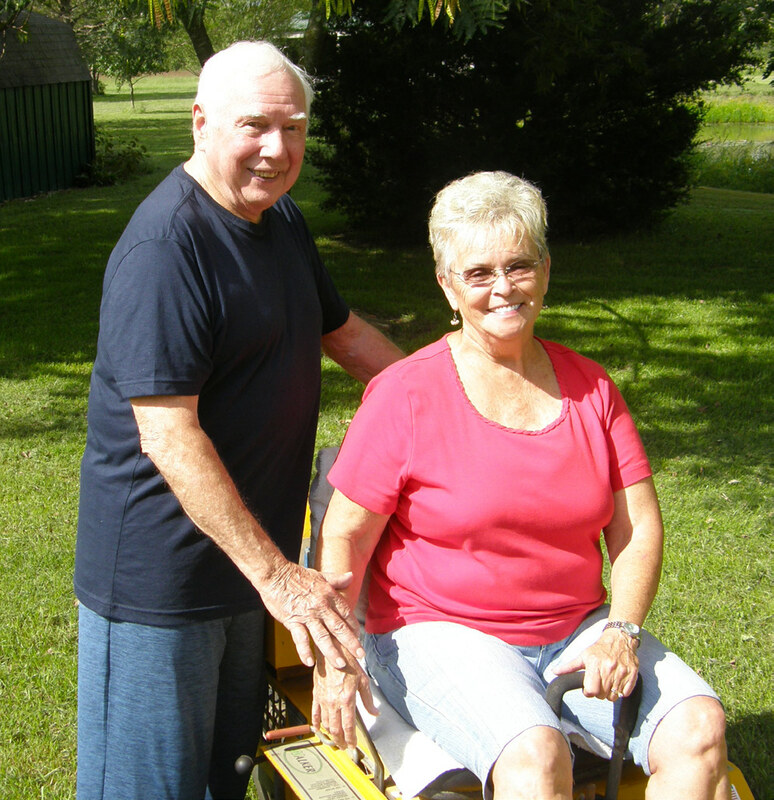 She says she doesn’t let anyone else use her mower and that includes Richard. He admits to driving it in and out of the garage a few times, though. 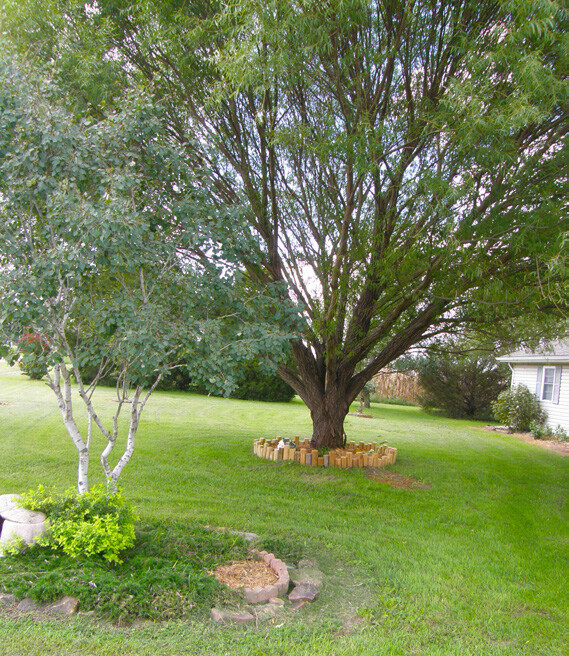 Today, that old elm holds seniority over a couple of willows, including a globe willow that stands tall in the front yard. There’s also a collection of cypress, apple and cedar, along with chestnut and black walnut, a Colorado aspen, a mulberry and a redbud, to name a few. She needed something other than her steeringwheel garden tractor to mow around the new plantings. On the top of her wish list was a compact zero-turn machine and she found one at a dealership just across the state line in Pittsburg, Kansas. The globe willow in the background is one of several trees Barb King planted since purchasing the property in 2000. Richard nods his head in agreement, although he admits to being allowed to drive it in and out of the garage a few times. King has five children—four boys and one girl—and they all have college degrees. Mom even went back to school at age 50 and earned an associate degree. “They have degrees, but not one of them has a Walker Mower,” she laments, referring to her children. 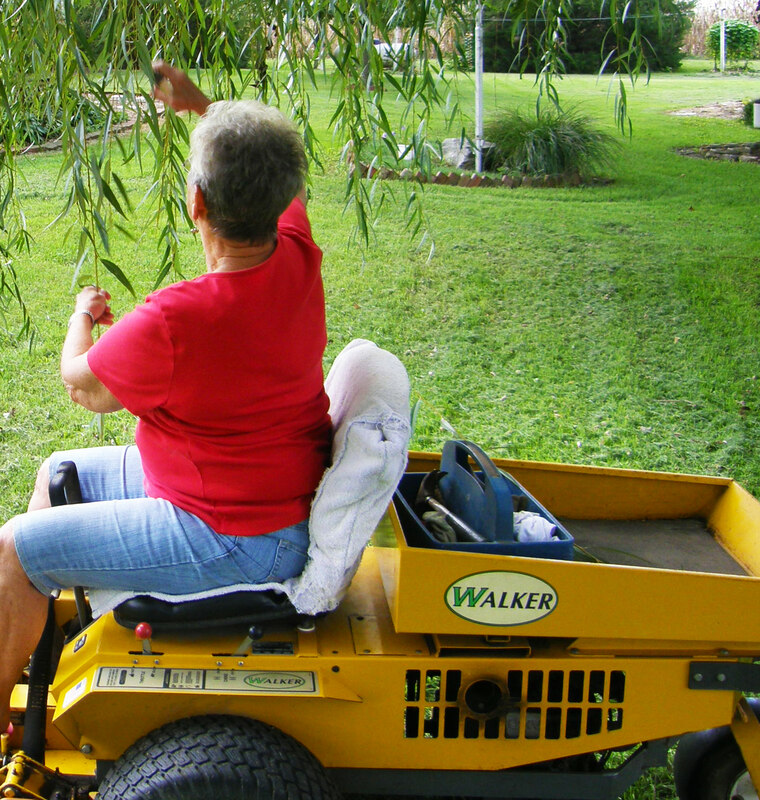 Barb King transports her landscaping tools in the back of her Walker Mower to make spot trimming more efficient. For larger jobs, she pulls a cart. 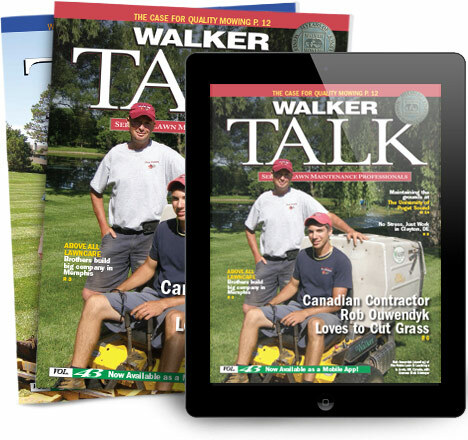 “I helped one son run his lawn maintenance [business] for four years and couldn’t convince him to purchase a Walker Mower. At the same time, I wouldn’t let him use mine either. No way,” according to King. King looks to a local mechanic for any doctoring her mower needs, and that’s been few and far between. Last year was the first time any real repair issue showed up—not bad for having the mower for 15 years. She considered purchasing a new one, but soon discovered that someone, somewhere was getting the word out about the mower’s value. A used machine, also nearly 15 years old, was selling for more than she originally paid for hers. On the advice of the dealer, who emphasized it still had many years of service life in it, she decided to keep her old one. 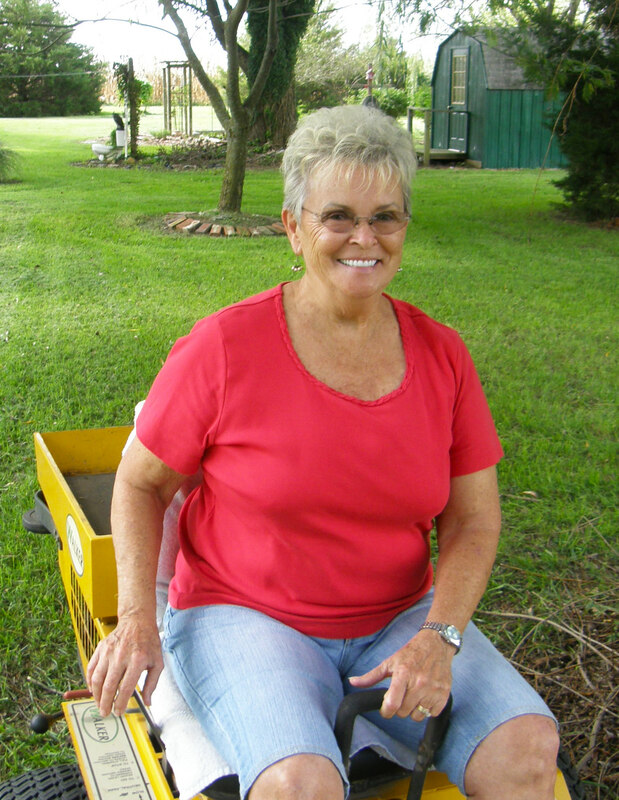 This operator plans to continue to put her Walker Mower through its paces. Says King, “I keep the grass mowed fairly tall to discourage weeds and carry my landscaping tools in the back for spot trimming. I can even pull around a cart for larger jobs.” She admits to getting the mower stuck a few times mowing too close to a pond in the backyard. No problem, though. Each time, she pulled it out with a truck. King mentions that when the property was originally purchased and house built, she had three requirements. She wanted an attached garage, a half basement with a safe room for protection from tornadoes, and a fireplace. Little did she know at the time that a Walker Mower would have made a nice addition to the list.